Faith and love combine to create this beautiful heart with cross pendant in 14K white gold from Apples of Gold Jewelry. A simple polished cross, crafted from 14K white gold, is the main focal piece of this pendant, along with the beautiful heart that is looped around the top and right arm of the cross. 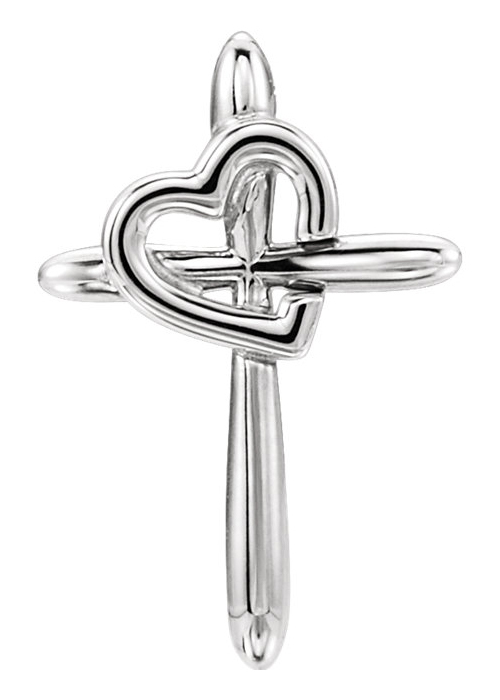 The heart, like the cross, is also highly polished 14K white gold. The women's pendant, which measures 3/4 of an inch tall and 1/2 o fan inch wide, is a great way to wear your faith and be reminded daily that faith and love go hand in hand. "The LORD is good, a strong hold in the day of trouble; and he knoweth them that trust in him. "(Nahum 1:7). We guarantee our Heart with Cross Pendant in 14K White Gold to be high quality, authentic jewelry, as described above.